So you want to incorporate DHSS into your classroom, but don’t know where to start? Digital Humanities and Social Sciences (DHSS) is an umbrella of convergent practices that enhance and expand the work of the Humanities and/or Social Sciences through the intersection of digital tools and technologies with Humanities and/or Social Science practices and pedagogies. 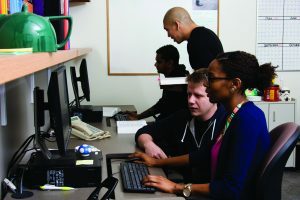 By explicitly using digital technologies in teaching, research, analysis, and knowledge-sharing, the Digital Humanities and Social Sciences (DHSS) invite new or deeper methods of data collection, organization, analysis, and presentation into the ways we interact in, and with, the Humanities and Social Sciences. In this way, when one talks of “DHSS,” one could be talking about developing software or one could be talking about extending the possibilities of critical interpretation because of that software. DHSS can have a reputation for being cliquish or exclusionary because many of the DHSS conversations over the last 20 years have seemed to be on computing. One may have felt as if one had to understand elements of programming (the back-end of the technologies we see and use) to fully appreciate or participate in conversations about the potential of digital technologies in the Humanities and Social Sciences. This expectation is sure to isolate those who do not know or understand computer programming. However, digital technologies have developed to such an extent that their inclusion in our lives is now a “total social fact” (Mauss 1966) and thus our participation in harnessing the power of digital technologies to enhance or complement meaning making is no longer contingent on us understanding computing or programming. Rather, our use and interest in digital technologies can centre on enhancing meaning making by using already developed technologies to develop what we can do with, and in, research and teaching. Many of us already do this in our classrooms without calling it “DHSS.” When we ask our students to search for a website or an article, to map something on Google, to collaborate on an online document, to participate in a discussion on Facebook we are inviting our students to find, collect, organize, and/or analyse using digital technologies. What makes practices explicitly DHSS practices, is when we thoughtfully and explicitly use these technologies to develop the skills of critical thinking, doing, and communicating. DHSS assignments and activities that are explicitly planned, developed, and taught with the aim of engaging with, and enhancing, critical and active opportunities for meaning making in and with the digital world are able to explore new modalities and invitations for accessing and developing knowledge. DHSS can then help students (and researchers) come to know in ways that traditional research and learning may not be able achieve (Marres 2017, Mortara et al. 2014, Ng 2015). In this way, DHSS can provide opportunities for reflective problem-posing critical literacy (Freire 2006) and greater opportunities for accessing knowledge and engaging with communities across and beyond our digital world. 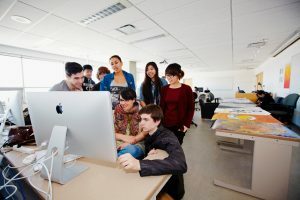 To engage in the Digital Humanities and Social Sciences is thus to engage in the Humanities and Social Sciences differently, perhaps more interactively, perhaps more visually, perhaps more connectedly, because of the ways we are exploring meaning by using tools, sources, and platforms enabled by the digital. Our project, as well as the projects and scholars we have drawn inspiration and examples from, align with the meaning-making approach to DHSS. That is, in this Instructor’s Guide, we have not focused on Humanities and Social Sciences computing – we have not developed code nor built elaborate databases. Instead, we have explored what can be done with digital materials in ways that allow us to understand and think through ideas, cultures, experiences, texts, documents, and images differently than analogue engagements alone. To ask and answer “research questions that cannot be reduced to a single genre, medium, discipline, or institution” (Burdick et al. 2012). This Guide is interested in these ideas becoming part of our teaching practice. Introduction by Samantha Cutrara, PhD, for the Office of the Vice Provost Academic, York University is licensed under a Creative Commons Attribution-NonCommercial-NoDerivatives 4.0 International License, except where otherwise noted.